ICv2 CEO Milton Griepp kicked off the ICv2 Conference at New York Comic Con on Wednesday, October 8th with a presentation on industry metrics related to the theme of the Conference, the New Comics Customer (see "Comics, Graphic Novel, and Digital Thought Leaders Gather at ICv2 Conference"). ICv2 had previously released its estimates of the 2013 digital market, and the estimates of the print market it had created jointly with Comichron, revealing a total market of $870 million last year (see "Comics and Graphic Novel Market Reaches $870 Million"). 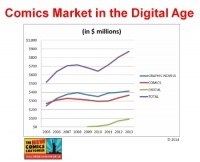 The graphic representation showing the total market and each of the formats in which comics are sold (comics periodicals, graphic novels, and digital) shows the acceleration of growth in the digital age. The past three years have witnessed a growth of 35 % across the board as digital, comics, and graphic novels have all increased. "What retailers tell me, what the limited data that's been released says, and what I believe to be true, is that there are people that used to buy print that are now buying some or all digital," Griepp said. "But that's more than made up by people that were engaged, or re-engaged, by digital and otherwise would not be involved with comics at all." 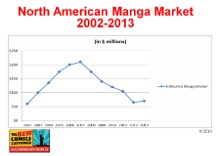 ICv2 revealed its 2013 market size estimate for the North American manga market: $70 million, up 8% from 2012. That was a turnaround from five consecutive years of market declines that began the year of the financial crash, 2008, and continued through the collapse of Borders. The biggest factor cited by Griepp was the emergence of a new major hit, Kodansha's Attack on Titan. 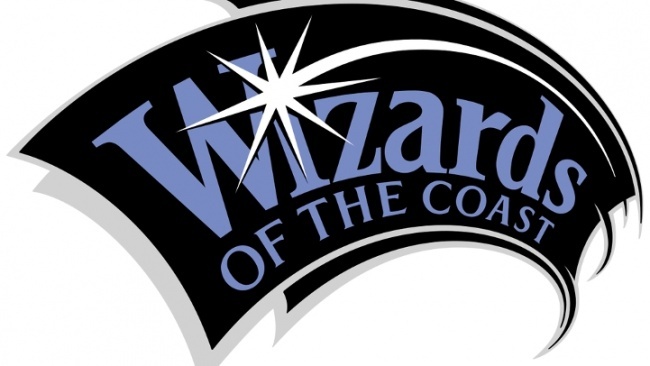 So far this year, Griepp noted the trends are a 3% increase in comics, graphic novels up double digits, and a "flat-ish" year for digital sales, although that could change in the fourth quarter and with more distance from comiXology's removal of in-app purchasing on iOS platforms as it was acquired by Amazon. Yet, the most revealing aspect of Griepp's presentation was on the demographics and sources of the new comics customers. First, Griepp presented new work on the categorization of graphic novels, which is one way at looking at different audiences. ICv2 broke down graphic novel sales across channels for the summer months of 2014 and found that graphic novels for kids accounted for 14% of the market, manga accounted for 19%, and the traditional American/western graphic novel content for adults accounted for 67%, or 2/3 of the total. 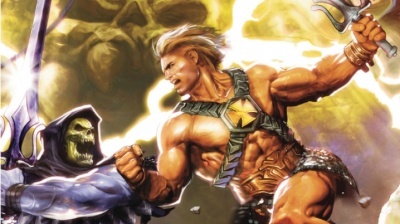 ICv2 found dramatic differences, however, in where those different types of graphic novels were sold, with traditional graphic novel sales split roughly 50/50 between the comic and book channels, but around 90% of sales of both kids graphic novels and manga in the book channel, and only around 10% in comic stores. Growth is coming from three demographic groups, Griepp said, including the traditional comics customers (teen and young adult males), kids, and women. 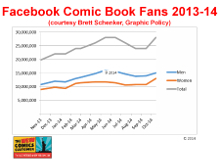 Most encouraging from Griepp's presentation was the graph showing the growth of comic fans and Facebook, and their gender mix. Based on research by Brett Schenker from Graphic Policy, the gender mix has improved as the number of fans has grown over the last year, with men accounting for about 54% of comics fans and women 46%, and much larger numbers overall. This gender mix was contrasted with the DC’s 2011 Nielsen survey of "New 52" readers, in which 93% were male (see "’New 52’ Appealed to Avid Fans & Lapsed Readers"). There's certainly been some evolution of the audience since then, but the difference also represents the varying appeals of different kinds of content, Griepp said. As schools and libraries have increased their offerings of graphic novels since 2000, lifetime customers are being created and easily channeled into comics through digital platforms, mass markets such as Walmart or Target, the bookstore market, and adapting comic stores. Griepp also argued that events, particularly the nationwide and in some instances international explosion of comic conventions; socialization of new fans, particularly on social media such as tumblr; and the wellspring of media exposure in movies and on television are driving new customers into the industry. 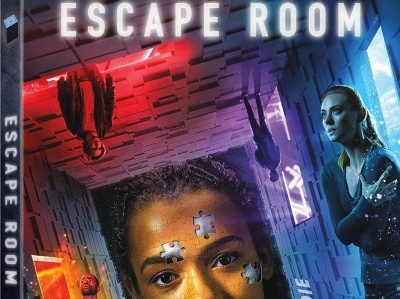 Media exposure has been particularly powerful, with movies and television dramatically increasing the exposure of comics properties, Griepp said.